Does anyone seriously think that Nintendo is not building a high-def capable system? You can’t even buy a SD TV larger than 20 inches anymore. Reggie probably told the truth when he said “there is no Wii HD” as it’s probably not named Wii HD, but there has to be some sort of high-def gaming system in the works. If there isn’t, Nintendo is in trouble. Nintendo made the right decision to make the original Wii not powerful enough to run HD graphics and therefore less expensive. It became an instant success because of not only the novel motion controller and easy-to-like bundled game, but also the relatively low starting price of $250 when compared to the Xbox 360 and PS3. If Nintendo had built a more powerful system, one of those points would have given way and events might have been a tad different. Plus, back when the Wii came out, HDTVs were still a luxury. They were only available in larger sizes and a higher prices. Now tube TVs are all but gone and increasingly small LCDs are reaching 720p resolutions. By next year, 1080p will probably be the standard resolution for 32-inch or larger screens and every TV will be at least 720p; Nintendo will need to put out a system accordingly. Of course this next-generation system will employ a motion control scheme. It’s not like Nintendo is going to take a step backwards. This system might not be called the Wii HD, but it’ll follow the Wii philosophy and be high-definition. Even if Nintendo outs a system next year that’s as powerful and cheap as a nettop today, it will be able to handle at least 720p graphics with a good graphics driver. Nintendo has proved that gameplay and accessibility are more important in the marketplace than graphics, but as time passes and more households upgrade to high definition, it’s becoming the standard, and Nintendo will have to work within those parameters. 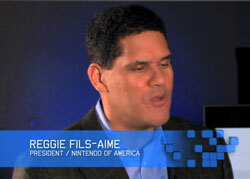 Reggie would never tell us a lie. He’s not like that. However, you can bet that Nintendo is working on a low-cost, but also high-def capable, Wii successor as we speak.